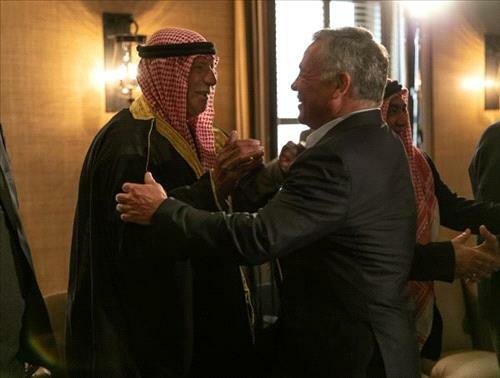 AMMONNEWS - His Majesty King Abdullah, the Supreme Commander of the Jordan Armed Forces-Arab Army (JAF), met on Monday at Al Husseiniya Palace with retired brothers-in-arms who served with His Majesty in the Second Royal Armoured Battalion. King Abdullah expressed pride in all JAF personnel for their commitment to defending the homeland, stressing his commitment to maintaining outreach to brothers-in-arms to check on their conditions. His Majesty noted the importance of benefiting from the expertise of retired servicemen and highlighting their achievements to youth. Monday’s meeting, attended by Chairman of the Joint Chiefs of Staff Lt. Gen. Mahmoud Freihat, came ahead of Veterans Day, marked on 15 February. The retired servicemen expressed their pride in having served alongside the King, reaffirming their commitment to serving the homeland and commending His Majesty’s outreach to military retirees. During his military service, the King, in 1992, became commander of the Second Royal Armoured Battalion, which is part of the 40th King Hussein bin Talal Royal Armoured Brigade. His Majesty led one of the battalion’s platoons as a second lieutenant in his early military career, and later assumed command of the entire battalion as a lieutenant colonel. Formed on 15 October 1952, the battalion is one of the oldest in the JAF. It fought in the 1967 and 1973 wars, and 53 of its personnel gave their lives as martyrs defending the homeland.